Line your disposable bowl with plastic wrap. Tape down the edges of that plastic wrap to the bowl. Cover the table you are working on too. Inflate a balloon in the shape you want the basket to be – egg shape, round, whichever you choose. This is the size of your basket so be sure to inflate to the size you want. Drop your string into the bowl and fully cover it in stiffy. Be sure the string is saturated, but not in a pool of Stiffy. Wrap the end of the string around the top of the balloon to get started. This will hold that first piece of slippery string in place until you can get enough in place that it will hold itself. 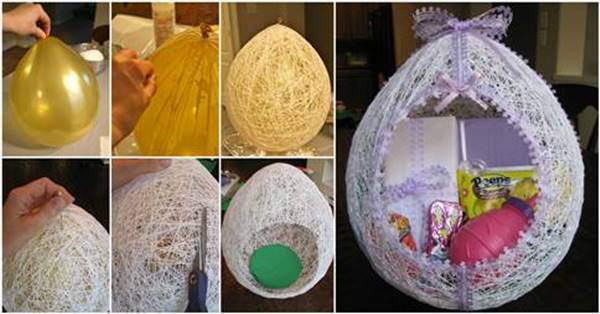 Continue wrapping your egg until you’ve got complete coverage. You’ll want to add more Stiffy along the way when you get to string that isn’t saturated. Set your basket in a bowl or cupcake tray to dry for 24 hours. Half way through the drying process, turn your egg on its side so the bottom can dry. After the egg has had plenty of drying time, break out a pin and pop the balloon inside. If you can, pull the top out, but if not, grab it once you cut a hole. 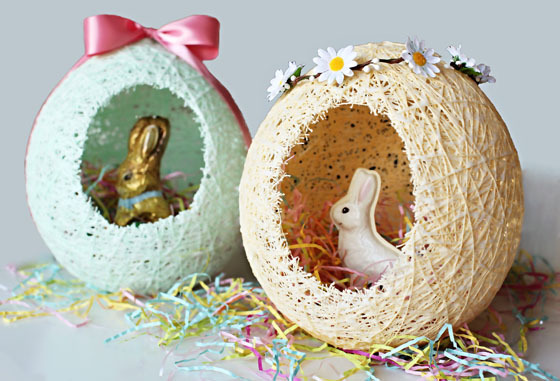 Using your scissors cut a hole in the basket so you can fill it with Easter grass and goodies.